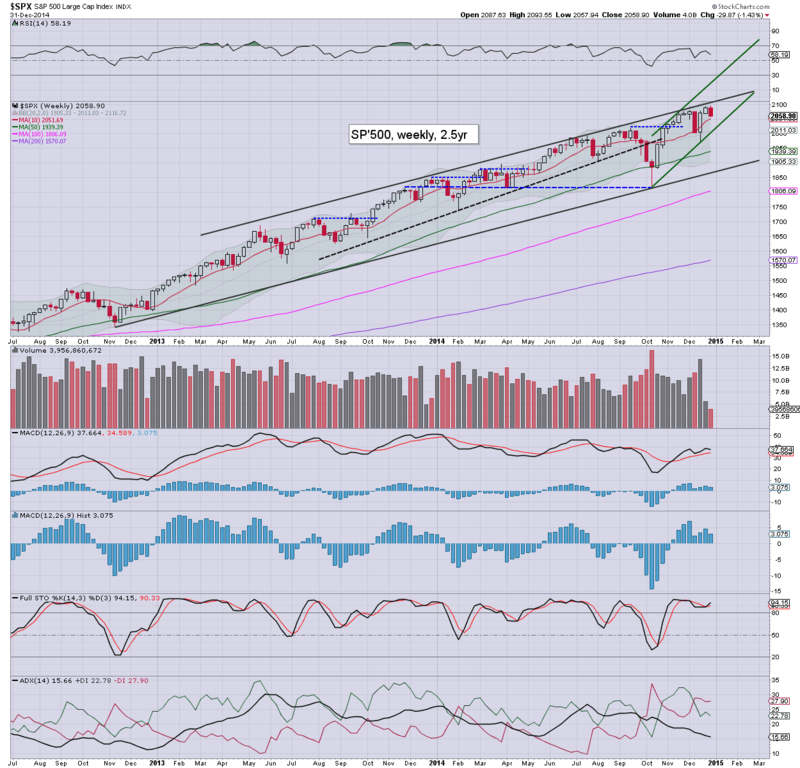 US equities clawed higher from an earlier low of sp'2046, settling -0.7pts @ 2058. The two leaders - Trans/R2K, settled lower by -0.4% and -0.5% respectively. Near term outlook offers a brief test of the 50dma (2040) early next week, before renewed upside into the sp'2100s. Interesting day... but overall.. its all minor moves. I see a few are already calling sp'2046 (38% fib retrace of 2092/1972 wave).. as a short term floor. In any case, I can't see the market trading under 2k any time soon. 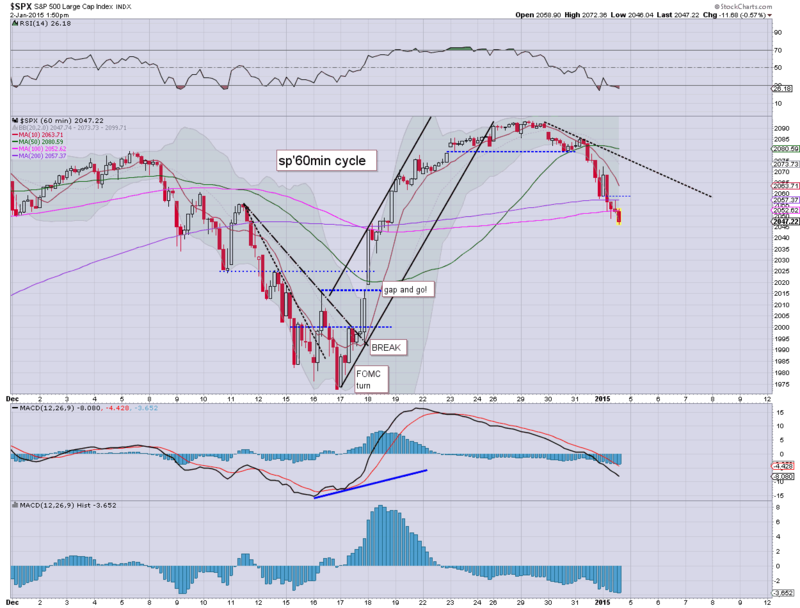 US equities remain moderately weak, with the sp' having broken a new cycle low of 2046. 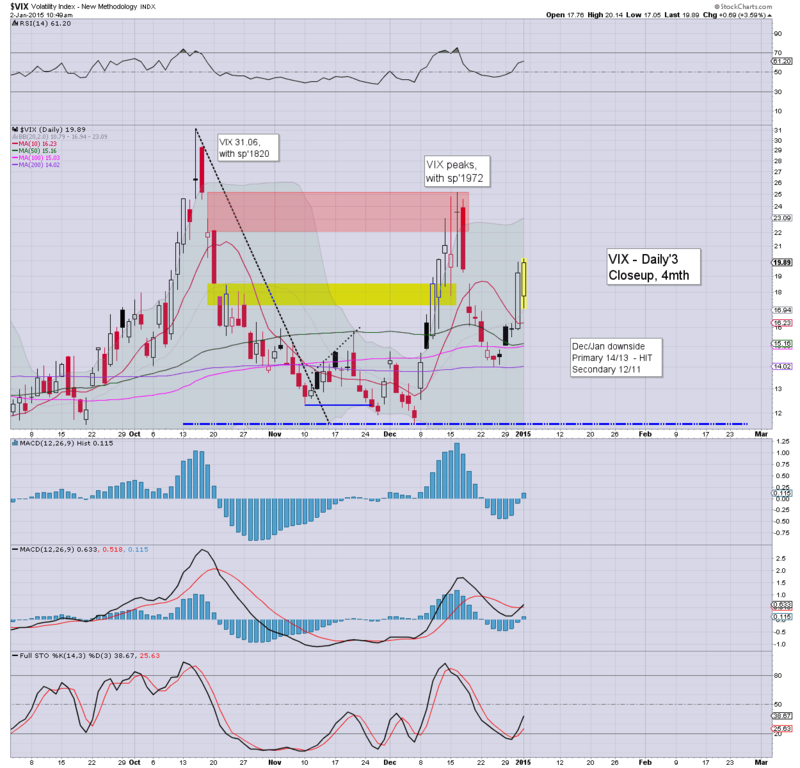 VIX remains notably red, -5.0% in the low 18s. Metals are cooling from earlier swing gains, Gold +$2. Oil remains very weak, -2.4%. Hourly cycle is offering a turn, but I can't take that seriously as a key floor. Seeking a hit of the 50dma.. along with gap support (especially seen on the R2K).. equivalent to sp'2040.. very likely on Monday. back at the close.. to wrap up the holiday week. 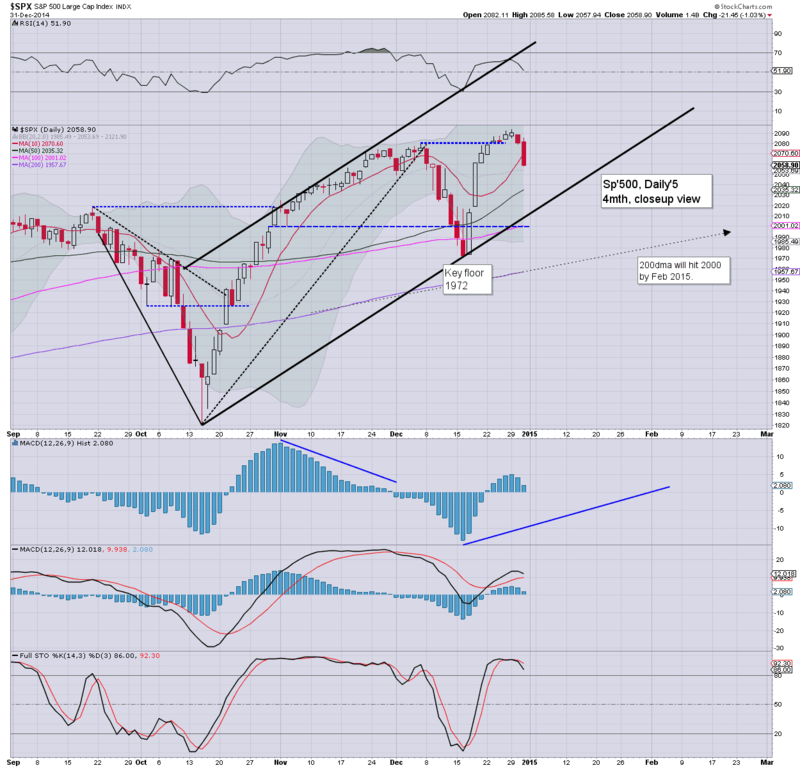 Well, it looks like we're headed for sp'2040.. where the 50dma will be lurking on Monday. That equates to R2K @ 1180/75, where there are 3 aspects of support. No doubt many will be calling the last few days as a genuine sign that the market is in real trouble in Q1... but frankly, I can't take the declines seriously. US equities remain moderately weak... with the sp' having slipped to 2048.. a mere 0.5% from a challenge of the 50dma. Metals are holding the swing gains, Gold +$9. Oil is clawing back upward from the pre-market low of $52.03. Notable weakness in the R2K, -1.2%. 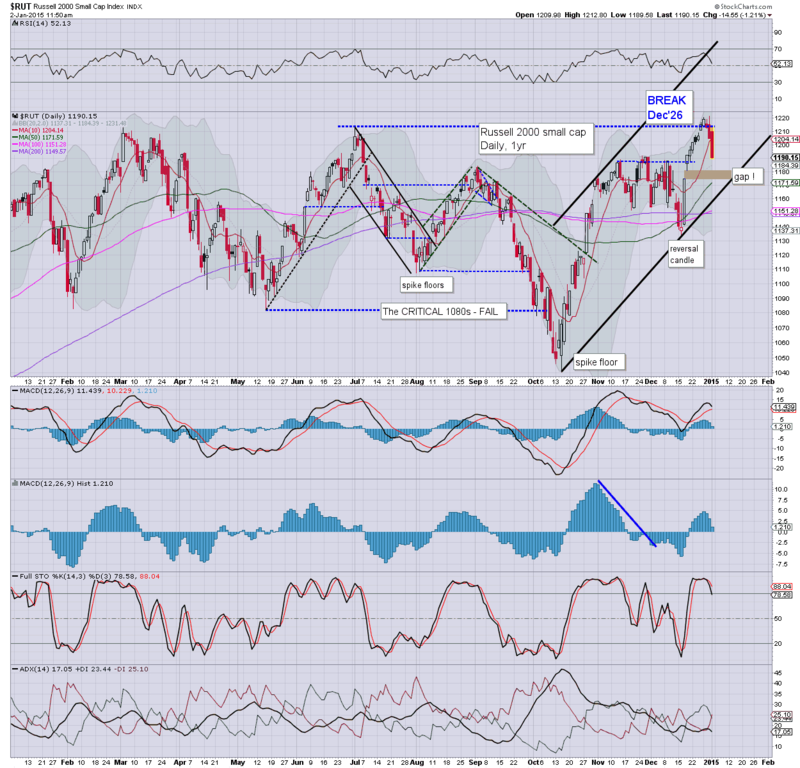 *R2K offering a clear gap zone around 1180/75, another 1% lower... suggestive of sp'2040 next Mon.. and then a turn upward. For the equity bulls... its been a messy end to 2014... and the year is not starting so great with a significant reversal from sp'2072. *back from a few hours sleep.. it helped.. sorta. 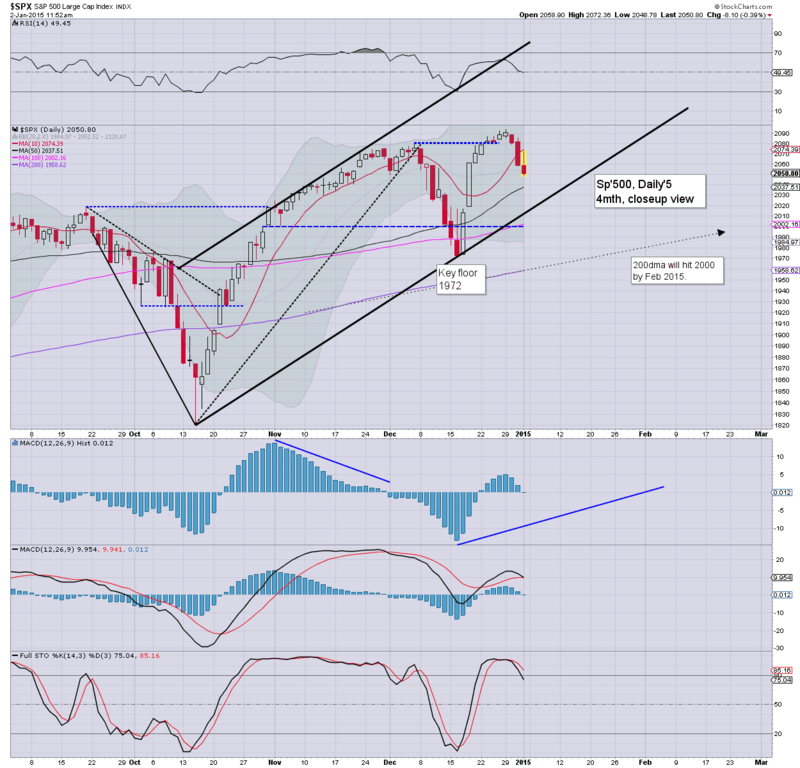 Next downside key target is the 50 day MA of sp'2037, by next Mon/Tue that will be around 2040. 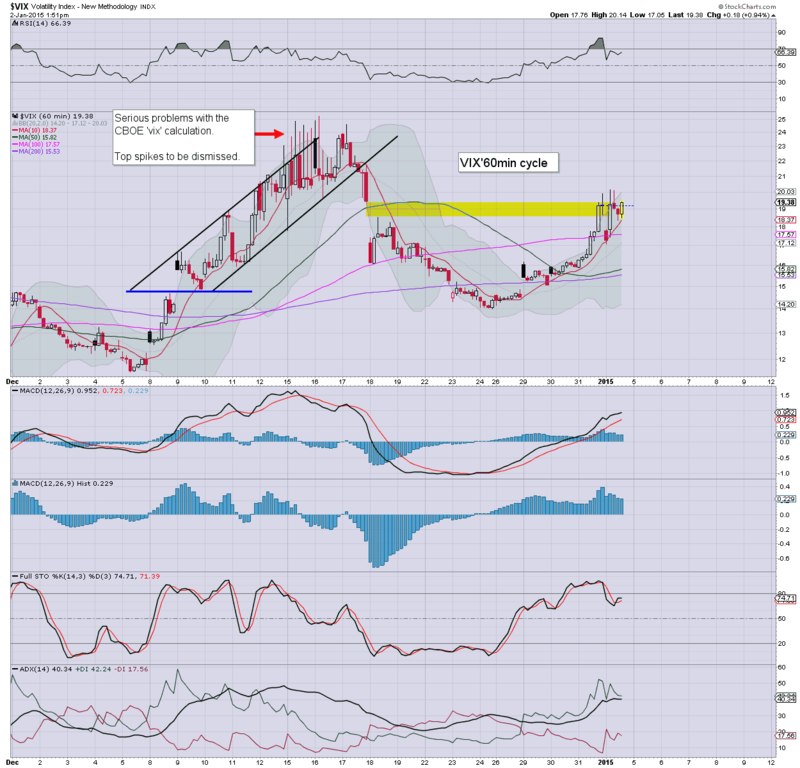 VIX is notably higher for the fifth consecutive day.. with a break above the key 20 threshold. Frankly... it is surprising to see. *on any outlook, we're going to close with net weekly declines, so... equity bears will have that to begin the year. Well.... a new trading year is set to begin. I do understand why some were getting moderately excited at the weakness across Wednesday, but I can't see this market going much lower. The sp'2130/50 zone looks a very viable target for late Jan/early February. Notable early strength: US Dollar, +0.5% @ 90.80... the giant 100 level is coming, and that is going to be a major problem for the precious metals (along with the miner stocks) and indeed... energy prices. *Frankly, I am exhausted.. I've been awake since 2am EST, I'll spare the details, but suffice to say, I will likely be on a go-slow today... if I drop offline later today.. it'll be because I've fallen asleep.